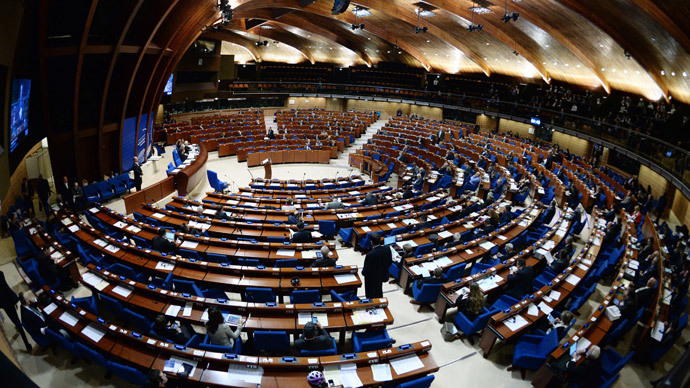 The Parliamentary Assembly of the Council of Europe (PACE) has decided not to restore Russia’s voting rights until April. Moscow was first stripped of its rights in PACE after Crimea joined Russia last year. PACE is a 47-member state organization dedicated to upholding human rights, democracy and the rule of law, overseeing the EU Court of Human Rights. It meets four times a year since 1949 in Strasbourg to adopt recommendations, resolutions and opinions, which serve as guidelines for the Committee of Ministers, national governments, parliaments and political parties. “As PACE stripped Russia of the right to vote in its governing bodies, we can no longer speak of any contacts with the organization,” he explained. PACE also backed an amendment that called on Russia to free Ukrainian pilot Nadezhda Savchenko in 24 hours or turn her over to a third party. Savchenko was detained in July and is in Russian custody. She is suspected of involvement in the murder of two VGTRK news network journalists in eastern Ukraine in June. Following the assembly’s vote, Pushkov said that Russia retracts its earlier suggestion on PACE visiting Savchenko in custody. In turn, PACE’s monitoring missions in Russia will also have to suspend their work, he added. Before the assembly vote session in Strasbourg, the amendment on stripping Russia of the right to vote and excluding it from PACE governing bodies further in 2015 was supported by a parliamentary committee. “The amendment that the Russian delegation has been again deprived of the right to vote, to participate in the governing bodies of the Assembly – the Bureau, Presidential and Permanent committees – was passed by one vote, 35 for and 34 against,” said the deputy head of the Russian delegation, Leonid Slutsky. The vote on the amendment resulted in 160 in favor and 42 against, with 11 abstentions. It was based on the Assembly's Rule 8, which refers to "a serious violation of the basic principles of the Council of Europe" and "persistent failure to honour obligations and commitments." Slutsky said the committee’s vote came as an “unpleasant surprise” since initially the amendment was turned down by a majority. Thus Austrian delegate Stefan Schennach, who chairs the PACE monitoring committee, argued that the Ukrainian conflict cannot be resolved "without the full-fledged participation and the political will of Russia." “The rapporteur on Russia’s credentials, Stefan Shennah, recognized [the amendment] as destructive and destroying the entire architecture of the resolution," Slutsky said. The blocking of Russia’s voice in PACE became a “flagrant violation of the fundamental principle of democracy,” believes Sergey Zheleznyak, deputy chairman of the Russian State Duma. The limitation of the Russian delegation’s powers is yet another “discriminatory act” encouraged by “pro-American forces,” believes Russian Senator and a member of the Committee on International Affairs, Igor Morozov. “And it is of great regret, since PACE is ceasing to serve as a parliamentary debate platform, where we can discuss key issues of our time, where the delegates have an opportunity to explain to each other their national position,” Morozov said. “Depriving Russia of its powers essentially means prohibiting the Russian parliamentarians from answering the questions they keep asking us – whether it is Crimea, Ukrainian refugees, or the situation in the southeast,” he explained. “It is impossible to give a reasoned and cogent response, when we are deprived of a voice,” Morozov added. Russian lawmakers have previously said that Moscow will leave PACE if its rights are not restored in 2015. "If the sanctions against the Russian delegation, imposed last April, are renewed, if Russia is stripped of its right to vote and participate in the assembly's leading bodies, we will leave PACE and suspend our membership until the end of 2015," Pushkov said on Tuesday. Last April, PACE suspended Russia’s right to vote and excluded it from leadership positions, until the end of 2014 in retaliation for Crimea voting to join Russia. The Russian delegation did not attend the session to protest the motion. Russia was stripped of its PACE voting rights in April 2000 in connection with a counter terrorism operation in Chechnya. Moscow's rights were fully reinstated the following year.